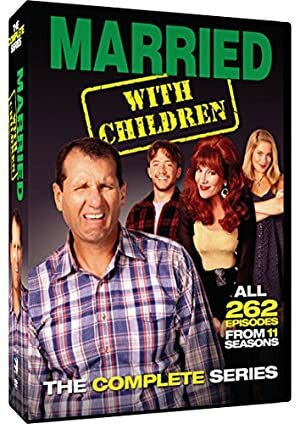 Married With Children was a satirical sitcom that ran from 1987 to 1997. 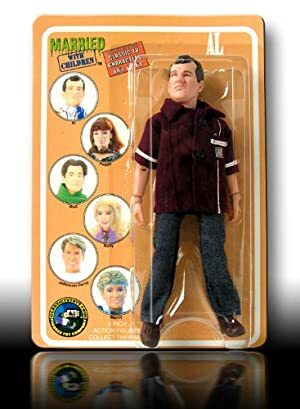 The over-the-top humour about a crudely dysfunctional American family was relatively novel back then, and gave the series an eager following. 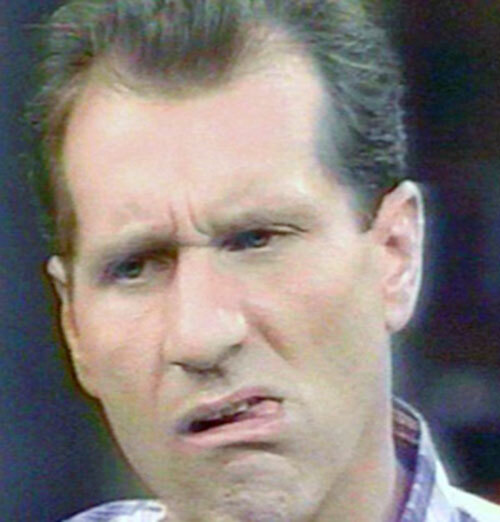 We have two takes on Al Bundy. This older, tongue-in-cheek one, and Peter’s take. Other Aliases: “Alga”, “King Al”. Known Relatives: Unnamed Parents, Aunt Betty, Aunt Nell, Efrim (father-in-law), Unnamed Mother-in-Law, Peg (Wife) Bud (son) Kelly (Daughter) Seven (adopted son). Group Affiliation: Founder of No MAM, New Market Maulers Baseball Team MVP. Base Of Operations: Chicago Area. Height: 6’ Weight: ??? lbs. 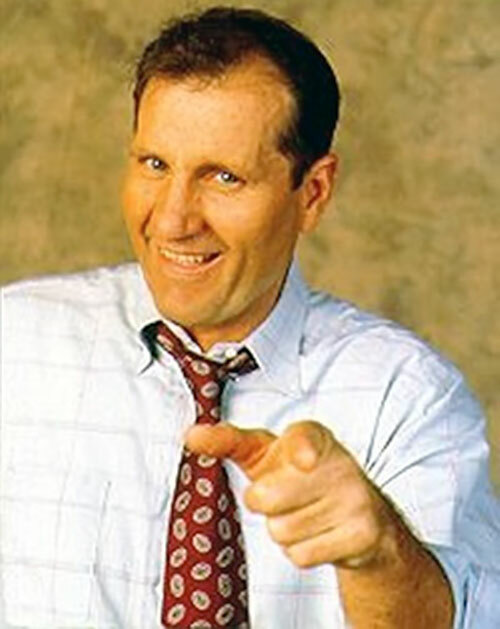 Al Bundy is a man of few talents. He is still a fair hand at football, as well as brawling (he gets into more than his share of fights, and usually comes out the winner unless grossly outnumbered). His foot odor is so foul as to be overpowering. The stench is superhuman. To quote Meat Loaf, “Al was a varsity tackle with a hell of a block”. He was quickly on the way to making a name for himself in amateur football. He had the potential to go pro, but that was not to be. In Al owns word’s, “a red headed witch called on Al to step up to the plate to marry her” (or perhaps the other’s merely stepped back?). The witch promised Al fame and power if Al would marry her and provide her with an unspecified sum of money at a future time. Since it was a shotgun wedding and Al was falling-down drunk and couldn’t defend himself, he had no choice but to go through with his vows. Al’s father-in-law quickly put a curse on him because his daughter married outside of the family. He gave Al powers that would make him a laughing stock in the community. Despite this, Al continued to overcome every challenge they put before him. His wife’s family, which Al calls “hillbillies,” cursed him with two kids to support, a car that won’t run and can’t get rid of, and a job he cannot stand. They have sent swarms of fat women to torment Al at his job but still he continues to persevere. Al continues to fight the evil at home and abroad. He has battled the Devil, saved an English town from a curse, and formed a church called NO MAM. He has saved the world from alien invasion. He continues to keep America clean by wading in mall fountains and picking up the loose change polluting the water. He revels in fighting the forces of evil in local strip bars. Al is a troubled but fun loving hedonist. He is rude brash and obnoxious but still loveable. He revels in being the universe’s whipping boy – he takes pride in the fact that things rarely, if ever, go his way. Don’t bother, unless he’s selling shoes to Granny Goodness. Chemical Attack can only be used barefoot. Truesight limited to seeing through Marcy’s disguise. Area Knowledge (Chicago Area Strip Clubs), Pet (Buck), Scholar (sports, shoes, cars). Arch Enemy: Marcy Darcy/Rhodes, MIA (Fat Jokes, “Adult Entertainment”), SIA (sticking hands in pants while sitting on couch), Serious Irrational Dislike (overweight women), Dependents (Peg, Bud, Kelly), Unluck. DODGE [BODY 04 STR 04, Regeneration: 02, Running: 04, R#8]. By Daniel Caithamer and Andrew Lee. Source of Character: Married With Children, www.tattat.force9.co.uk/al-index.htm (defunct), Danny’s concepts.